Any surface can be a breeding ground for bacteria and germs, and that is a particularly troubling fact when it comes to health compromised patients in hospitals. The CDC’s website states that about one in 31 hospital patients has at least one healthcare-associated infection. Devices that are touched by both patients and doctors, like medical equipment and computers, can pose a significant risk of spreading contagions. Unlike a doorknob or a handrail, consumer computers and devices are sensitive to harsh cleaning and being exposed to liquids and abrasive cleaners. Your standard LCD monitor is not protected against liquid ingress and will malfunction upon contact with it. 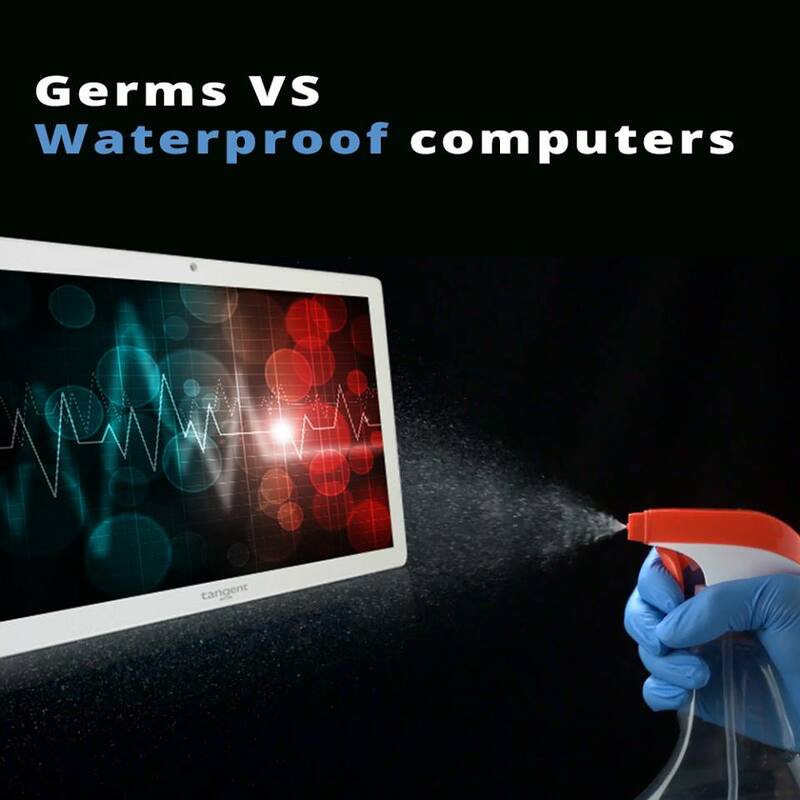 Luckily, antimicrobial surface treatment technology has become quite advanced and companies like Tangent are producing medical grade LCD monitors that are not only treated with antimicrobial coatings, they are also protected against water damage so that they may be appropriately cleaned in line with hospital regulations. Antimicrobial surfaces mainly work to suppress the growth of bacteria and harmful microorganisms, and stop the spread of microbes. In addition to deterring bacteria, germs and molds, the coating also minimizes stains and degradation of plastic on the surfaces they are applied to. Antimicrobial agents come in a variety of types like chlorhexidine, ammonium compounds, and silver. Tangent’s flagship 22 inch medical LCD monitor has a cast aluminum chassis, is factory treated with an antimicrobial additive to battle surface contamination, and is rated an an IP65 protection level against dust, cleaning liquids and water. Because of big initiatives to improve in sanitation, prevention, care quality, and overall awareness, data from CDC’s hospital healthcare-associated infection prevalence surveys show significant reductions in overall healthcare-associated infection prevalence and central line prevalence between 2011 and 2015. 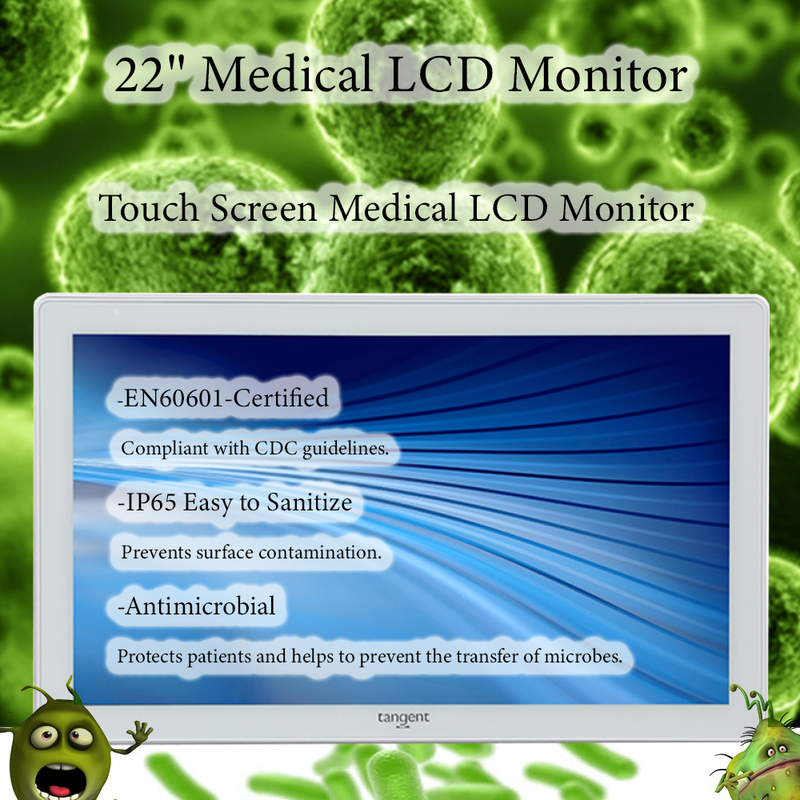 And speaking of the CDC, Tangent’s medical LCD monitor is EN60601-1 certified to be compliant with CDC guidelines for environmental infection control and isolation precautions. This 22″ LED backlit medical LCD monitor features a 16:9 aspect ratio widescreen display, a PCAP 2-point touchscreen, and on screen display buttons for power, brightness, and auto tune. A variety of mounting options like point of care carts, movable arms, or desktop stands are possible with the VESA 75 mounting bracket. The Tangent medical LCD monitor also comes with integrated speakers, a feature not often seen on a monitor. With the success of antimicrobial agents on medical devices to help prevent the spread of pathogens in clinical settings, the technology is now being sought for use in a wider setting like businesses and homes. Wherever the demand may be, Tangent’s medical grade LCD monitor is up to the task. Hospital equipment often is advertised as being antimicrobial, but how is it possible for a LCD monitor or tablet computer to ward off pathogens in a medical setting without being wiped down with disinfectants all the time? It seems odd for a collection of plastics and wires to promote any sort of health benefits, but medical advancements and information technology have long gone hand in hand. Antimicrobial additives can now be blended into plastic surfaces during the manufacturing process to provide lasting protection from microbes, harmful bacteria, mold, fungi and viruses. This minimizes the risk of the spread of infection, staining, smells, and material degradation. When you take into account that hospital associated infections have caused more than 100,000 deaths in the United States, it’s no wonder that great efforts are made to sterilize every surface possible. 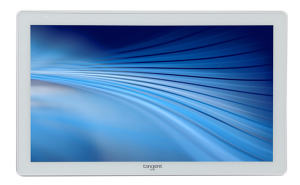 Another benefit of antimicrobial plastic is that the additives have been tested to last for the expected lifetime of the treated product, like Tangent’s Medical LCD monitors. Once infused into plastic, antimicrobial additives don’t leech from the surface, cause discoloration or affect the clarity of the plastic. This ensures that the equipment can be confidently kept in medical spaces to keep patients safe for years without degrading the quality of the device. Every Tangent Touch Screen Medical LCD monitor comes factory treated with an antimicrobial additive to battle surface contamination. The 22” Medical LCD monitor also has an IP65 rated front panel, which means it’s rated as dust tight and protected against water projected from a nozzle. One doesn’t expect a random hose to be shooting water around a hospital, but strange things are known to happen. Actually, this provides a very beneficial added layer of cleanliness to the LCD monitor. The monitor can be easily cleaned and wiped down with no chance of damaging it’s internal components or adversely affecting its touch screen capabilities. Microbes and bacteria are a threat that is naked to the eye, and yet another invisible and potentially hazardous peril can arise from electronics in a medical setting. Before 1977, there was no standard for safety on medical equipment and electric shocks and shorts were commonplace. Since then the EN 60601-1 family of standards was developed. Its scope covers the safety, essential performance and electromagnetic compatibility of medical electrical equipment and related systems. Tangent’s Touch Screen Medical LCD is certified EN 60601 and is compliant with CDC guidelines. Painstaking measures are taken to ensure that these LCD monitors are safe, sanitary, and effective in a medical space. It’s VESA 75 mounting capability allows for affixing the LCD monitor to an arm, point-of-care cart, or stand. Pair this sleek LCD monitor with one of Tangent’s antimicrobial, waterproof keyboards, and a rugged, fanless PC to truly experience a long-lasting, dependable, hygienic computer system. There is enough to worry about in a hospital settings without having to consider whether your computer components are making patients unwell or spreading dust and spores. The CDC largely cites government agency regulations and the Spaulding Classification Scheme when determining recommendations for maintaining a safe medical environment regarding the cleanliness of equipment involved with or in the vicinity of treatment. In the early 90’s, OSHA (the Occupational Health and Safety Administration) enacted a standard called “Occupational Exposure to Bloodborne Pathogens.” The intent was to eliminate or at least minimize occupational exposure to bloodborne pathogens. A major component of the standard is that all equipment, environmental, and working surfaces be thoroughly cleaned and decontaminated with a disinfectant after contact with blood or other potentially infectious materials. Another 90’s study expanded this and the Spaulding scheme by dividing noncritical environmental surfaces into housekeeping surfaces and medical equipment surfaces. Medical equipment surfaces, which includes computer equipment like medical LCD monitors, can become contaminated with infectious agents and contribute to the spread of pathogens. For this reason, it was noted that noncritical medical equipment surfaces should be disinfected with an EPA-registered low- or intermediate-level disinfectant. With so many regulations, treatises, and recommendations in place, it’s very important to utilize equipment that will both keep patients safe and maintain a compliant standing. Medical LCD monitors are no exception to these rules. Not only is the Tangent 22” Medical LCD monitor EN60601-Certified to be compliant with CDC guidelines, it is also IP65 certified against water, dirt, and dust ingress. One could shoot low pressure water jets directly at the front panel of the unit and it would continue to function normally. The medical LCD monitor can be cleaned, disinfected and wiped down without any threat of damaging internal components. The monitor is a true flat capacitive multi touch screen, which makes it capability to be so thoroughly washed and sanitized all the more impressive. Tangent also took into consideration that many surfaces are naturally a microbial and pathogenic cesspool, so they ensured that the casing of their medical LCD monitor is factory treated with an antimicrobial additive to battle surface contamination. And since Tangent is so keen on being in line with standards, their medical LCD monitors are VESA 75 compliant for standard mounting to a number of things like a pivoting monitor arm or point-of-care cart. Other certifications the medical LCD monitors carry are FCC Class A, which classifies them as a product marketed for commercial or industrial use, and CE certification, which indicates conformity with health, safety, and environmental protection standards for products sold within the European Economic Area (EEA). 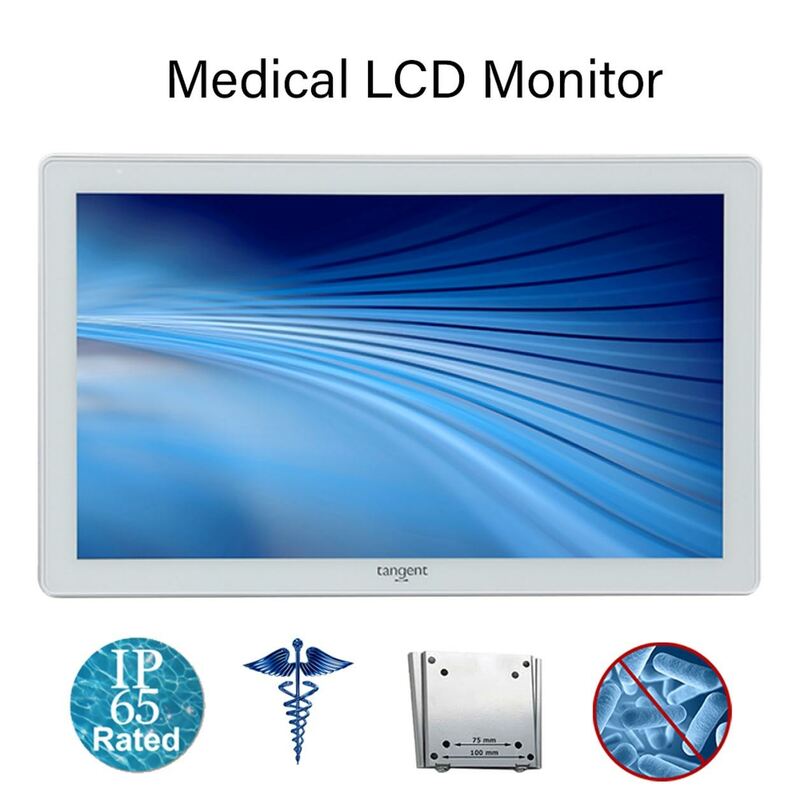 Compliance with regulatory measures are one of the highest priorities for Tangent on their medical LCD monitors and all of their other quality medical grade systems.